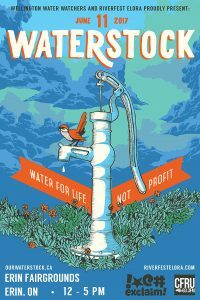 “Water for Life not Profit” is the rallying cry of Waterstock 2017. Music, food, art and protest come together on June 11th to raise awareness around corporate control and exploitation of this most precious resource. A musical line-up that includes Jim Cuddy, Bry Webb, Harrow Fair and Reuben Bullock will join over 40 chefs from across Ontario at the Erin Fairground. Tickets are only $10 – bring your own plate, cutlery and festival beer mug to make this a minimal waste event. And don’t forget to wear blue! In case you can’t make it on the 11th – or if you want to lend your support to the “Say no to Nestle” campaign – water shares can be purchased on-line.